Sally Hansen has featured again and again on this blog - check out this post from earlier today - and their cuticle and nail treatment pen was one of my beauty essentials in U Magazine. Now's your chance to try out a selection of their best sellers for yourself. Open internationally, five readers will receive a goody bag with the following products. ONE Complete Salon Manicure Nail Colour: With more than 40 shades in the range, in a variety of finishes from cremes to shimmers to metallics and more, each winner will receive a gorgeous bottle of Complete Salon Manicure to try out for themselves. TWO Complete Care 4-in-1 Treatment: Another multi-tasking timesaver of a product, this moisturising brush-on strengthener can be used as a smoothing base coat, glossy topcoat and growth treatment. It's currently my base and topcoat of choice! Salon Effects Real Nail Polish Strips: Love nail art but can't apply it to save your life? Yeah, me too, which is why I absolutely love these easy to apply strips of real nail polish decorated with stunning, salon effect designs. They come in nine different varieties including metallics, patterns and prints - see Kitty Kitty in action on my nails here. To enter, just follow the simple steps below. Good luck everyone - and remember to check back soon as it will be giveaways a-go-go over the next few weeks, to celebrate the site's second birthday. am such a huge sally hansen fan. its the only polish i buy!! Nice post .This is beautiful colour of nail polish love it. dying to try those nail wraps. 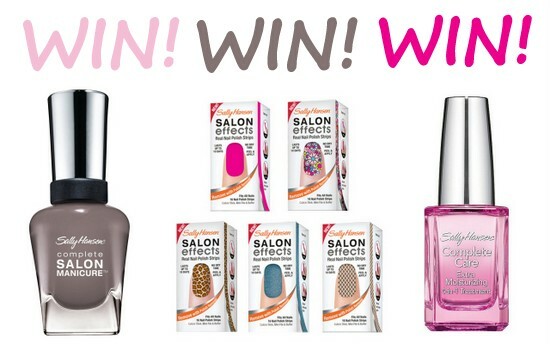 Great giveaway, I've entered :) love Sally Hansen nail wraps!! Love Sally Hansen stuff! Great comp!! Gorgeous, would love to try these then I wouldn't need to hide my hands! Sally Hansen has awesome nail products! Great giveaway Emma! I have never tried anything from Sally Hansen. Thanks for this lovely opportunity! I'd love to try salon effects! thanks! Fab goodies. I must admit I haven't used a Sally Hansen colour for a long time (if ever) so it would be good to try it - it looks fab. I'm dying to try that cuticle and nail treatment pen! You can't really beat SH for the old nail stuff! They have it down! I have not been able to find the 4-in-1 complete care anywhere down here where I live, so upsetting. Thank you for the chance to win these lovely birthday goodies. So exciting!! This is a fantastic giveaway! Fabulous and i love the array of colors and designs! I really want to win this, its coming into summer here and I NEED to get my nails in pretty summer shape! TRIED SALON EFFECTS, NOT IMPRESSED!!! Lovely, need something for my nails at the moment, they're a bit sad looking! What a fab prize, please count me in! Oooh, awesome prize. I love Sally Hansen! love the prize! thanks for the chance. The nail strips look really cool. I'm a big Sally Hanson fan! Need a newbie to try!! I'm dying to try the nail wraps! Another great giveaway! I cant keep up with all the fab prizes!! Is this open to Italy ??? Thank you! You are too generous! What a great lil giveaway. I love sally hansen products. I'm in!! thank you so much! I never tried it, it doesn't sells in my country. I would love to try it!